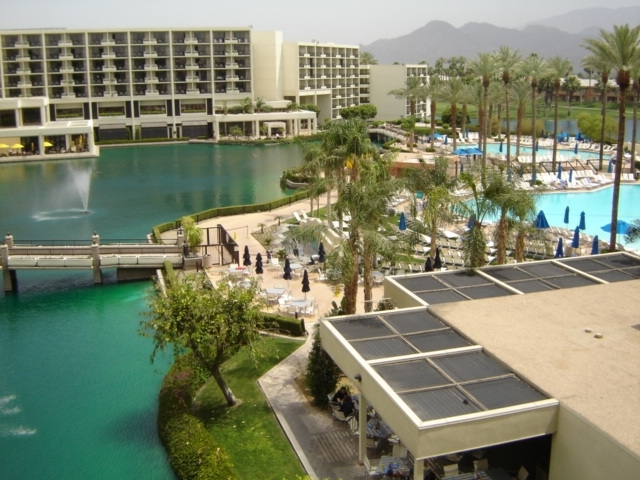 As I mentioned yesterday, I’m currently in Palm Springs (actually Palm Desert), California for a public TV conference. The photo at left is the view from the balcony of my hotel room. As you can see, it’s quite nice here, though I’ve yet to have an opportunity to try out the pool. I’d hoped to post some stuff here in my off hours, but it just doesn’t look like that’s going to work out. And Thursday I drive a rental car to Los Angeles to meet Vic and take a few days’ vacation. I’ll be visiting my old stomping grounds in Hollywood, and going to Disneyland for the first time in too many years. The downside is that I’ll be completely offline from then until next Tuesday. However, if you’re interested, through Thursday morning I’ll be blogging about the PBS conference for the WILL-TV web site. Click the “TV Worth Blogging” image in the left-hard bar to read about upcoming public TV programs.